Belts, Flanges, Pulleys & Pulley Stock, Sprockets and Chain - Nordex , Inc.
Nordex Offers a Large Selection of Timing Belt Pulleys. Nordex manufactures these pulleys to the industry standards as listed in the Nordex Design Guide. 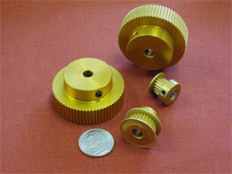 Custom pulleys are also manufactured to meet customers individual specifications. Please inquire for unlisted sizes and material. Custom machining available. Nordex Manufactures Timing Belt Pulleys to Industry Standards as well as Custom Pulleys. The improvements in timing belt technology allow close manufacturing tolerances of the profiles which helps create the smooth entry into and out of the mating pulley. This both reduces wear and provides greatly enhanced positioning accuracy. Engineers are finding uses for the Nordex belt system in a variety of applications, especially when the requirement is for more power and higher accuracy in a smaller envelope. Nordex belts and pulleys offer the design engineer the flexibility of having a stronger, more durable belt with greatly improved positioning accuracy. Used in both low and high speed drives, the smooth mating of the belt and pulley plus the ability to use a smaller belt for the same amount of given work, significantly reduces vibration and noise thus affording a quieter operating environment. Pulleys with mating belts are available in Inch Sizes .080 pitch to 3/8″ pitch and Metric sizes 2 mm to 8 mm pitch. Nordex’ pulleys are manufactured with a pin hub, split hub or hubless configuration. Nordex also offers round belt pulleys, cluster pulleys, idler pulleys and pulley stock along with sprockets and chains. Mating belts are available in neoprene and polyurethane as well as round belts and Dacron core, stainless steel core and coreless belts in a polyurethane jacket.